If you are reading this chances are you find it worthwhile to surf and participate on the ever expanding information cloud known as the blogosphere. And I thought I’ll share a little nifty web-service called Gravatar that is fun to have for such purpose. Most blogs will let people display a small image icon or avatar whenever they leave a comment in the discussion section of a post or forum. But in many sites, unless you have created an account previously (if such option exists in the first place) the avatar displayed for you will be a boring generic silhouette or a random colorful pattern (like the ones appearing on this blog). Enter Gravatar. The name stands for Globally Recognized Avatar, and what this service does is let you associate an image of your choice to the e-mail address you normally use for posting comments on blogs. The avatar image will then follow you around from blog to blog, provided the blog or forum has enable Gravatars (most blog applications now do). It is a centralized avatar repository. Creating a Gravatar is very simple: just signup, upload the image of your choice, and define which e-mail address(es) you want that image to be associated with. That’s it. Your e-mail address will not be used for anything else. No spam. 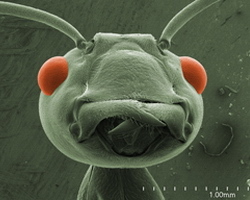 I, for example, can go and harass Alex Wild at Myrmecos Blog with my less-than-insightful comments and he will always have to deal with my green ant Gravatar made from a SEM image of Oecophylla smaragdina (Fabricius). A side note. If you don’t have a blog, you should know that bloggers will appreciate comments by readers no matter how small or simply they are (the comments that is).